I recently had some cuts in the simulation, with a window appearing at the bottom of the screen that says some files are missing. I used the dateiverwaltung program, and in this I used the "file structure check" function to see if files are really missing. 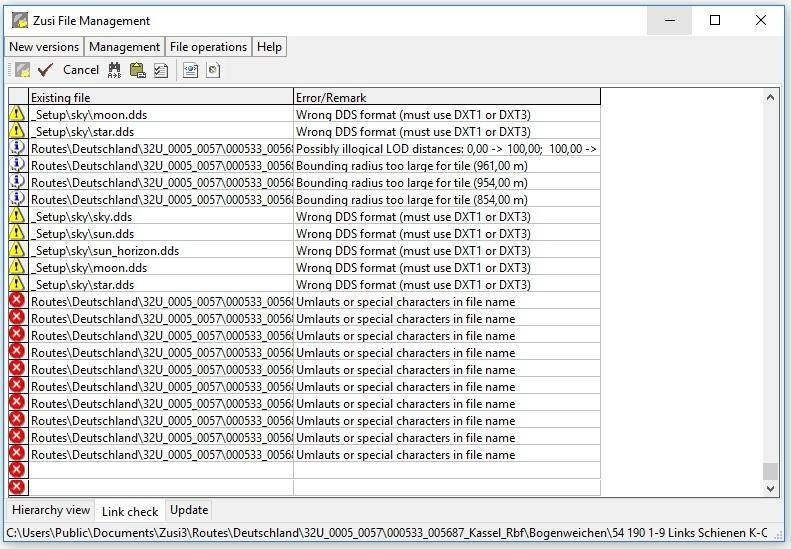 "Umlauts or special characters in file name"
"Wrong DDS format (must use DXT1 or DXT3)"
"Bounding radius too large for tile"
"Bounding radius 0 or undefined"
".lod.ls3 does not contain LODS 1-3"
Is it because of these warnings that I have received errors in the simulator? Zuletzt geändert von ut438 am 12.07.2018 16:08:44, insgesamt 1-mal geändert. If the simulator complains about missing files, you should probably look for "File missing" warnings. You can run a structure check with all other warnings disabled. Yes I do. And there are several missing files. You'll need to reinstall the add-on that contained the missing files (or reinstall Zusi if those files did not come with an add-on). Could you post a list of the files that are missing? You can use Management -> Export table (link check) to generate a text file. The result is a very extensive list. In this link you can download, I have not found the way to post it here. What should I do with all the lost files and other problems? You can ignore everything but "File missing". The other warnings are for add-on authors and should in most cases not impact the simulation. As for "File missing", these all seem to be false positives, occurring in temporary or internal files only. So my question is: which missing files does the simulator even warn about? Could you post a screenshot? Zuletzt geändert von Johannes am 13.07.2018 04:38:33, insgesamt 1-mal geändert. Ok, I will ignore the faults you mention to me. I'll be away from home until Sunday. As soon as I can, I'll tell you what the failures are. But it only happened to me occasionally. Now I say it by heart, but I think that some failures noticed a lack of rolling stock. Sorry for the delay but I've been busy with the construction of the new desk, so I did not have the operating simulator. Now I was able to do tests again, and after the last updates, it seems that I have problems on the route SALZKOTTEN-GOETTINGEN-KASSEL. On some other occasion, a pop-up window appeared with the message that "there is not enough memory" in German. I'm using the simulator with a 2k monitor for front view and 3 (at the moment, one more is coming) 600x800 touchscreens for the displays of ZD. The PC is a i7 with 8gb of RAM, and nvidia gtx970 card. At the moment it seems that I have no problems with the rest of the routes, but I had more like this with other services in this same route. Please, could you help me solve it? The error message is a consequence of a memory problem. Do you use the default settings? Well ... now it seems that I have a more serious error ... Last night thinking that maybe it was missing files, I uninstall the simulator, and today I reinstalled it. Since then, every time I try to load a route, I get a popup window with the error " format '%' ungültig oder nicht kompatibel mit argument ". I have uninstalled and reinstalled several times and I still have the same problem. I have tried to start without updates and the same. With all the updates installed, I also have this problem. Now I'm really scared! I do not have much idea about informatics and I do not know where to go with this problem. I do not understand why I have this problem now, previously when I installed Zusi for the first time, I had no problem. Thank you very much Carsten for your response. I did not modify any aspect that I remember. "format '%' ungültig oder nicht kompatibel mit argument ". That's a problem of formating the English error message. Please select German language for a test. I just uninstalled, and install in the German version. And the same error appears. In the lower part, a line of errors dialog appears, and different errors appear and in different numbers, depending on the route you open, but all begin with "MAIN ID 4 AND SECONDARY ID 1 NOT PRESENT IN VEHICLE (....) changing the numbers too depending on the route opened. Zuletzt geändert von ut438 am 07.11.2018 14:16:35, insgesamt 1-mal geändert. You needn't reinstall but just select "German" in die settings of ZusiDateiverwaltung. Did you do updates after reinstalling? What is your current Zusi version? -15:06:55:122: Haupt-ID 7 bei fahrzeug (RollingStock/Deutschland/Epoche3/Reisezugwagen/BRD/Bpmz291.rv.fzg) nicht vorhanden. -15:06:56:986: Haupt-ID 2 und Neben-ID 2 bei fahrzeug (RollingStock/Deutschland/Epoche5/Reisezugwagen/Doppelstockwagen/DBpbzfa_766.rv.fzg) nichtvorhanden. These errors are different depending on the route you choose (these 2 are from different routes). If I try to return to the English language, the problem of the pop-up window reappears every time I try to load some route. F. Schn., I apologize, I've been looking for the folder you mentioned but I have not found it in the zusi3 directory. - Uninstall zusi3 by the windows control panel, and then delete the folders that have not been deleted from the zusi3 directory. -Install zusi3 from the pen drive. I only deleted what was in the zusi3 directory (C / programs / zusi3). Is the zusi data folder located outside this directory? I have used the search engine and I have not found it. Well, it seems that the problem has been solved, thanks to your help. I had not noticed that zusi used folders located in different directories. But in fact, I have deleted the file you mentioned and I have reinstalled the addons, and now everything works perfectly, even with the menus in English. I also took advantage to down some graphic aspects of the simulation, and for the moment I not had problems in any route.